The snow season is coming, so is the high demand for the people movers. We are always looking after our clients and want them hire the best suited car. Besides it will save them some money too. There are now so many 7 seaters available. In this article we will focus on the mini vans only and I promise to put together another post on SUVs that suit larger families. Pros: Can fit up to 7 people and would be very roomy inside. The car offers European safety, lots of power, diesel and good boot space. It is great for big kids and adults to travel comfortably. The vehicle is very reliable and goes the distance. This car is also known as a Volkswagen Transporter before being released as Multivan. Cons and gotchas: height can be an issue in some carparks (look for 2.1m clearance). It is 7 seats but the 2nd row would be great as a bench seat making it an 8 seater. It can come with the table as an extra but how often do you think you might use it? A lot of people told us they have never used it. We are not sure if it was just our issue, however Low Cost Car Rentals team decided to replace all of our VW with Toyotas just because of our door problems in this specific VW model. 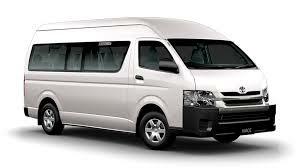 Pros: Newer models come as 9 seater which suits large families nicely. It is quiet spacious inside, european safety and quality. The car is reliable and well priced among other 9 seaters offered for hire. Cons: Height can be an issue. Longer body than the VW Multivan for parking. The boot space is not as big but there is some room inside the van for bags etc. Pros: It is probably one of the cheapest vans for this size. Mostly this car comes as a 7 seater, however it is possible to rent an 8 seater as well. Hyundai iMax offers good sized seats in the back. You can even walk around inside. You will be amazed with the great boot space too. Some rental companies add an extra 9th seat in the first row making it a 9 seater. Cons: doesn’t have the european safety, you can also note some heaviness in the body and doors. Therefore the cheaper price. If you’ve ever opened a VW or Mercedes van then you know what I’m talking about. Some vans come slightly smaller in size if you only have little children (with little legs). Otherwise, make sure you ask the rental company about the dimensions of the specific model they offer. Pros: well priced, 8 seats, drives like a car as not as big as other vans, easy to park, no height restrictions to worry about. The newer Carnival model looks amazing with a new shape. Cons: Not as spacious. Although it’s an 8 seater some of the seats are smaller in the back. Check you can fit all of your car seats in and still fold down the seat to get into the back. Carnival doesn’t have the heaviness in the doors and body compared to an european van. Older models had some engine problems. So make sure the company you rent it from offers 24/7 road-side assistance. Fortunately, I overheard the manufacture has already switched to new engine so be careful renting older models or cars with a lot of mileage on it. Always ask, if the rentals include the road-side assistance as well. 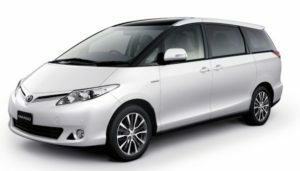 Pros: One of the best and the most popular rental cars among MPV. It is built to last and they just keep going and going (we see some older ones in our fleet and we have never had any issues with it). The car can be a 7 seater but most of the companies offer the 8 seater option. This vehicle is the most reliable car among all. It has very nice and attractive body shape. You will find it easy to drive and park. You will not have any height issues compared to the bigger vans. Cons: I could not think of any. You may pay a little extra but you will get what you paid for. Pros: european safety and heaviness in the doors and body, luxurious, reliable, roomy inside, great boot space, 8 seater and good full sized seats. Great for lots of kids, car seats and long legs. Cons: Price, price, price. Luxury cars offer great comfort but you will have to pay for it. Pros: roomy inside, 7 seats, reliable, luxury features. It is not as big as some of the other people movers. Cons: Price and size. It is slightly smaller than others and will cost you some buck since it is considered a luxury car too. Pros: Offers 7 or 8 seater options. It is not as big as some people movers so it will be easy to drive/park. Newer model has really changed and are larger.You will find some luxury features inside that will pleasantly surprise you. Cons: Price. Also, it is not as big inside as other people movers which can be an issue with carseats. Pros: 12 seater, european build (think heavy safe doors and body) and safety features. It is reliable vehicle of a great quality, Would suit really big families and long travels. Cons: Price – the vehicle itself isn’t cheap therefore the rental companies will have to price the hire fares accordingly. Height and size of van for shopping centres/carparks/parking can be a trouble. Pros: Big enough to fit the largest of families (OK maybe not the Duggars but plenty of room for everyone with 12 seats or 14 seats in the super long wheelbase), great for parties and playdates as extra seats, reliable and they go and go and go. The vehicle is well priced. Note: the word “commuter” means it is a people mover, also called full-size van and has 4 doors. Don’t confuse it with the commercial version of it that normally comes as a 2 seater and 2 doors, suited to move things. Cons: parking at shopping centres (you’ll need bus parking) and height considerations in carparks, OK parking full stop! Otherwise another great vehicle. The Japanese do some nice people movers that aren’t available from dealers and you might have seen a Nissan Elgrand around and there seem to be a few in Sydney. There is also a japanese version of Toyota Tarago called Estima – it mostly looks and feels exactly the same as the australian model. However it might come as a AWD and cost you more on petrol. Car Rental companies rarely supply the imports to their customers as they are more expensive in servicing and repairing. It could also get you in trouble with the road-side assistance if you need one – it might just take a little longer to help you when you need help. Among other imports: Mazda MPV (seats 7), Hyundai Trajet (seats 7, older version of Hyundai iMax), Mitsubishi Starwagon (comes as 7 or 8 seater), Mitsubishi Grandis (seats 7).